The Detroit Lions were struggling, having lost four straight games, as they hosted the Green Bay Packers on November 19, 1950. Coached by Bo McMillin for the third year, the Lions were nevertheless assembling talent that would make them a formidable team over the next few seasons. Fiery and talented QB Bobby Layne had been obtained from the New York Bulldogs and HB Bob “Hunchy” Hoernschemeyer arrived from the defunct All-America Football Conference. Rookies included guard Lou Creekmur and the last two Heisman Trophy winners, end Leon Hart from Notre Dame and all-purpose HB Doak Walker (pictured at right) out of Southern Methodist. 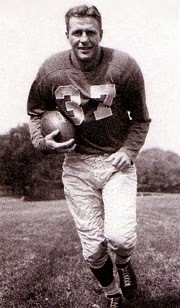 Walker had been a high school teammate of Layne in Dallas, Texas and then a three-time All-American at SMU who won the Heisman Trophy as a junior in 1948. An injury hindered his performance in ’49, but he still came in third in the voting for the coveted award. He had been a tremendous all-around talent in college, but at 5’11” and 170 pounds, there were questions as to whether he had the size to succeed as a pro, and there were doubts about his speed as well. But thus far, Walker was productive as a halfback who often caught passes out of the backfield, kick returner, and placekicker and punter. The Packers had a new head coach in Gene Ronzani, only the second in their history after the departed Curly Lambeau. They had a talented rookie quarterback in Tobin Rote and also benefited from the demise of the AAFC, adding end Al Baldwin and HB Billy Grimes. But the defense was dreadful, and after winning two of their first three games, the Packers were in the midst of a five-game losing streak. They lost badly to the Lions in their previous meeting. There was a small crowd of 17,752 fans in attendance on a dark and rainy day at Briggs Stadium. The opening period was scoreless, but both offenses cut loose in the second quarter. First, Bobby Layne threw a pass to Doak Walker for a 33-yard touchdown and Walker added the extra point. Green Bay responded with a series highlighted by Tobin Rote passing to HB Jug Girard for a 55-yard gain. Two plays later Rote connected with end Steve Pritko for a three-yard TD and Ted Fritsch tied the score with the PAT. Shortly thereafter, Green Bay got the ball back again when DHB Bob Forte intercepted an option pass by Walker at the Detroit 30. Rote threw to Al Baldwin for 28 yards and FB Jack Cloud added another touchdown for the Packers as he dove into the end zone from two yards out. Fritsch converted to put Green Bay ahead by seven. With time running out in the first half, Walker kicked a 35-yard field goal and the score was 14-10 in favor of the Packers at halftime. In the third quarter, Layne threw to Walker again for a 20-yard TD that put the Lions back in front by 17-14, Walker once again successfully kicking the extra point. Layne was injured, however, and Fred Enke came on in relief. Following the ensuing kickoff, Green Bay advanced 69 yards but Detroit’s defense stopped two runs from the one yard line to force the Packers to turn the ball over on downs. Pinned deep in their own territory, the Lions punted and the Packers regained possession with favorable field position at the Detroit 35. Once again Green Bay moved effectively, but this time a Rote pass into the end zone was intercepted by DHB Don Doll. Three plays later, the Packers got a break when DT Joe Spencer recovered a fumble at the Detroit 23. Following a running play, Rote completed a pass to HB Larry Coutre for 19 yards. Early in the fourth quarter, Cloud scored again for the Packers, this time plunging into the end zone from a yard out. Fritsch’s PAT gave the visitors a four-point edge. The Lions put together a 73-yard drive and, with the game down to the last two minutes, Walker struck once more with an eight-yard touchdown catch of an Enke pass. It was Walker again adding the point after and Detroit came away with a 24-21 win, Walker having accounted for every point. The Lions had the edge in total yards (376 to 309) and first downs (19 to 16). Bobby Layne and Fred Enke combined to pass for 241 yards for the Lions while Tobin Rote (pictured at left) completed 13 of 31 passes for 184 yards in defeat. However, the teams combined for 11 turnovers, with Detroit accounting for six to Green Bay’s five. The Lions won their next two games before dropping the season finale to end up even with a 6-6 record, which placed fourth in the National Conference. Green Bay won the following week before dropping the last two contests and tying for fifth in the conference with the 49ers at 3-9. 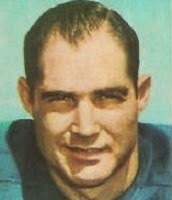 With the 24-point performance, Doak Walker’s scoring total was up to 91 and thus set a new franchise record, besting the 81 points by Bill Dudley the previous year. He went on to lead the NFL with 128 points and was fourth with 1262 all-purpose yards. Walker scored 11 touchdowns (five rushing, six receiving), kicked 8 field goals in 18 attempts, and was 38-of-41 on extra points. Continuing to display the all-around skills that had made him a college legend, he rushed for 386 yards on 83 carries (4.7 avg. ), caught 35 passes for 534 yards (15.3 avg. ), added another 302 yards returning kicks, and even intercepted a pass on defense that he returned 40 yards. Walker was a first-team All-NFL selection by the Associated Press and UPI and received second-team honors from the New York Daily News. He was also selected for the Pro Bowl.